Some have said one of our country's Olympic gymnasts, Simone Biles, may be the best ever. She's wowing spectators with her skill, talent, determination and incredible spirit. She's a grand success whose story could have so easily taken a very different turn if it wasn't for her grandparents. When she was young, her mother's drug addiction resulted in a stint in foster care. America's sweetheart joined the ranks of hundreds of thousands of kids whose parents can't care for them for many reasons including substance abuse, mental illness, unemployment or military deployment. Today over 400,000 children are in foster care. Of those 28% (or over 113,000) are in foster care with relatives while over 2,400,000 children are being raised outside the foster care system in grandfamilies (also known as kinship care). Grandparent caregivers hope that, if possible, the situation is temporary and their children will be able to parent their grandchildren again. The reality, however, is that 42% of grandfamilies have raised the children in their care for five or more years. Some, like the Biles, adopt the children while others have guardianship and still others have no legal relationship at all. They often take in the children with little to no warning and find their lives turned upside down. Rather than planning the next vacation, they're focused on the car pool and after school schedules. Grandparents may be on a fixed income that now needs to stretch to cover their own bills and provide for school supplies, child care, diapers and enough food to feed a growing child. Few supports and services exist to make the new responsibility easier to bare. Yet these loving grandfamilies save our country $4 billion a year by keeping children out of the foster care. New legislation called the Family First Prevention Services Act would provide federal support for prevention to give grandfamilies the support they need and help them keep children out of foster care. It passed the House, now the Senate needs to act to pass this important legislation. Children fare best in families. Compared to children being raised by non-relatives, those in the care of relatives have more stability, are more likely to be kept together with brothers and sisters and preserve their cultural heritage and community bonds. And unlike children in foster care, who age out of a system when they turn 18, they never age out of a family. 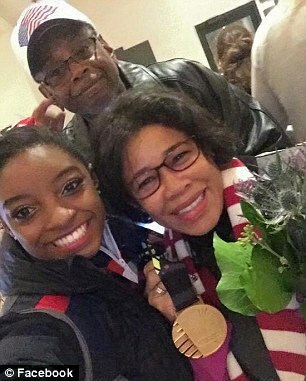 Simone's grandparents recognized her incredible abilities and invested and supported her as she grew as a gymnast. As our country is enthralled and inspired watching the wonder that is Simone Biles, let's not forget the kids who are on the path she was saved from by her grandparents. Let's work to make sure every child has what she has had--a safe, stable family that gave her roots while she sprouted wings.